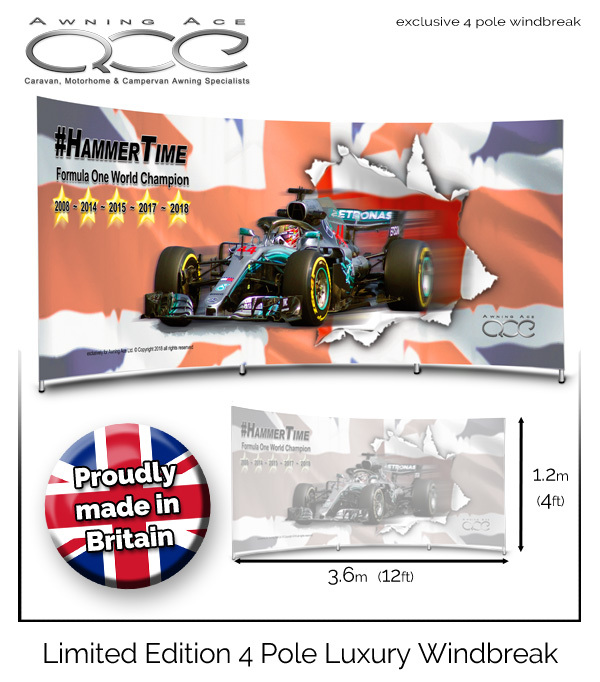 Celebrate the amazing five times F1 World Champion, Lewis Hamilton, with this amazing limited edition #Hammertime windbreak. Made in Great Britain from the best quality outdoor materials these striking windbreaks are made from waterproof fabric and strong, lightweight aluminium poles creating a highly wind resistant screen that offers UPF50+ sun protection. Make the most of your camping trip by guarding you against wind, sun and the prying eyes of fellow campers as you enjoy the scenery. The perfect shelter for the 2019 Grand Prix Season, the beach, campsite, park or in your own back garden, this Windbreak offers maximum wind and UV protection, shading you from the sun, blocking out wind and providing privacy from neighbouring campers. Windbreak features an eye-catching digitally printed limited edition design on PU coated 100% Polyester fabric. This waterproof fabric provides maximum UPF50+ sun protection (blocking out unto 99.7% of UV rays) and is fade resistant so the beautiful design won’t dull in the sun. The windbreak has a set of highly durable yet lightweight aluminium alloy poles, providing stability against the wind without weighing you or your travel bags down. The innovative poles are joined with a shock cord in their centre for easy assembly (simply give them a wiggle and they slot together) meaning you don’t have to worry about which pole goes where. Images and text Copyright 2018 Awning Ace Limited - All rights reserved.